Stores reference 22C/1305018. 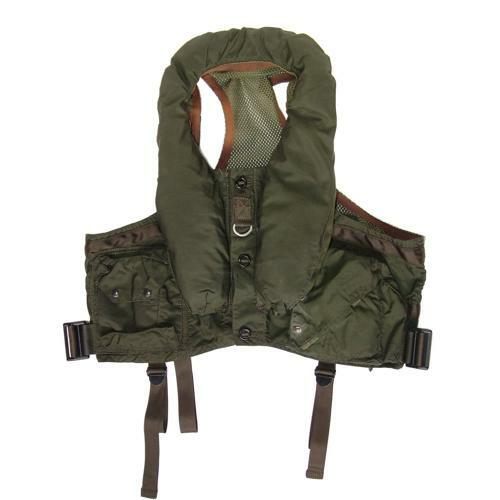 Manufactured by Beaufort (Air-Sea) Equipment Ltd. Olive green nylon waistcoat with mesh back and button fastening at the front. Adjustable belt at the waist and various adjustable leg straps. Complete with inflatable stole dated 2/79 and beaded pull handle, water activated signal lamp, whistle, lifeline/toggle and heliograph with instructions/pouch. Some verdigris on the press studs but in very good used condition overall. Retains manufacturer's label but the stores reference label is absent. We have removed the 'live' Kidde CO2 bottle as it is illegal to post but it is available for collection for an additional £10. Please contact us if you wish to purchase the bottle. Stock code MW23289.